The Save Childhood Movement promotes initiatives that celebrate childhood and protect young children's natural developmental rights. We really care about getting children back into nature because we think it makes for much happier, healthier lives. Worldwide research shows us that children are increasingly overweight, less connected to others, less able to freely explore and take risks and less able to play without being in the company of adults. According to the UK public health minister Anna Soubry, statistics from the latest Active People survey show only a third of boys and a quarter of girls meet the recommendation for at least 60 minutes of physical activity a day. Also, that nearly 30 per cent of adults are active for less than 30 minutes per week. All children, all families and all communities need nature. 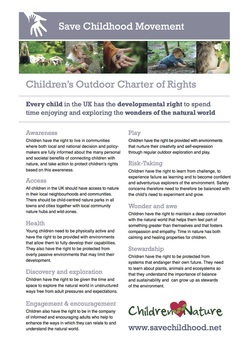 We help to promote and share the work of the international Children and Nature Network and the UK based Wild Network in raising public awareness of the issues and to come up with loads of fun ideas for schools, parents and children to do.